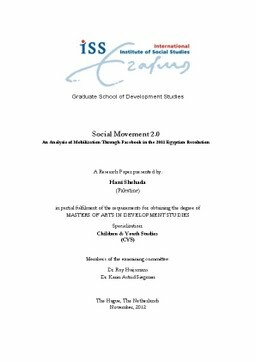 This paper examines the way in which social networking media were used in the 2011 Egyptian revolution. It focuses on the ‘We Are All Khalid Said’ Facebook page, which played crucial role in toppling the Egyptian regime signified by its President, Mubarak. By using various theories of social movements, the paper analyses the content of this specific Facebook page to determine whether and how this rather novel form of activism may constitute a new type of social movement. The data was submitted to a complex theoretical scrutiny to arrive at the following conclusion: ‘We Are All Khalid Said’ is both a group and a New Form of Social Movements. To this end, the paper makes a significant contribution to the literature in at least two orders. Firstly, it is one of the first studies that has extensively analyzed the content of a Facebook page to determine the extent to which it could be considered a new form of social movements. Secondly, the paper is at the forefront in using the literature on ‘group dynamics’ to determine whether or not a Facebook page is actually a group. It is for these two contributions, the paper pinpoints a gap in the literature with regard to new types of activism and social movements in the second decade of the 21st century.